You are going to be given the option of playing four different mobile Blackjack games when you are playing at a mobile casino site which uses Microgaming’s mobile gaming platforms. Be aware that Microgaming has both a downloadable App and also a web browser compatible mobile gaming platform and not all of their Blackjack games are available on each platform! With this in mind you will find below the mobile Blackjack games on offer on both of Microgaming’s mobile gaming platforms and information on what playing rules are attached to each variant that is available. Please note that the lowest house edge mobile Blackjack game is the single hand Classic Blackjack game and as that is the game that you will be attracted to playing due to its very low house edge we have complied a Best Strategy for Playing Mobile Blackjack guide which is going to show you how to play that variant perfectly, so do check it out! You are going to be able to access and play all three of the following Blackjack games either for free or for real money when logged into any Microgaming mobile casino site via their downloadable App. Classic Blackjack – Unlike when you are playing at an online casino using Microgaming’s gaming platform you are only going to be able to play their single hand Classic Blackjack game, and as that variant has a house edge of 0.13% as opposed to the much higher house edge attached to their multi hand variant of this game you will be making a good decision playing it! This game is a single deck game on which players are allowed to double down on any initial two card hand with a value of a hard 9, 10 or 11 and players may split any pair (but not an unalike pair of 10 valued cards) just once to make two new hands. Any number of cards card be dealt out to a split Ace as long as the value of that hand does not go over 21 in value and the Dealer will stand any hand he has dealt himself that is worth 17 or high in value including both hard and soft 17 hands. European Blackjack Gold – The European Blackjack game which is found on Microgaming mobile gaming platforms is a game on which with perfect strategy you should see it playing out with an expected long term house edge of 0.42% which does of course make it a much less appealing game than the one above. If you choose to play the mobile European Blackjack game at Microgaming powered sites then you will be playing a two deck game, and much like the game above the Dealer is going to stand his hand when it is worth either a soft or hard 17. Players are also allowed to double down any two card initial hand worth a 9, 10 or 11 and the rules regarding splitting a pair of cards and being dealt multiple cards to split Aces are the same as the Classic Blackjack game. Premier Blackjack – A brand new mobile Blackjack game has also recently been added to Microgaming mobile gaming platforms and this is their Premier Blackjack game, which is basically their multi hand European Blackjack game with another name! As the Premier Blackjack game is a multi hand variant of the European mobile Blackjack game above the house edge is the same and its game playing rules for both the Dealer and the Player are identical. You will find that you are going to be able to access all of the above mobile Blackjack games if you choose to play via your mobile web browser attached to your Android or iPhone device, however there is one additional Blackjack game on offer which is exclusively found on this HTML5 mobile platform as it is often referred to. This game is the Atlantic City Blackjack Gold game and this is a fairly low house edge game offering player who opt to play it with the best playing strategy an expected house edge of 0.36%. 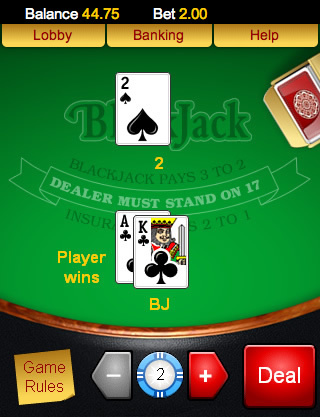 Below is an overview of the game play rules attached to this mobile Blackjack game variant. You need to be aware that this game uses a shoe which contains 8 full decks of playing cards and the Dealer is going to stand any hand worth 17 or higher in value which he has dealt out to himself. Unlike all of the other mobile Blackjack games from Microgaming you are allowed to double down any two initial cards dealt out to you when playing this game irrespective of the value of those two cards and you can choose to split both matching valued cards and unalike 10 valued cards. All of the above Blackjack game variants which can be accessed on Microgaming’s mobile gaming platforms have the industry standard winning payouts and as such when you have been dealt out a Blackjack hand containing any Ace and any 10 Valued card a payout of 3 to 2 is awarded to you, unless that hand is formed after splitting cards in which case the winning payout is the same as on all other non Blackjack hands which is even money. 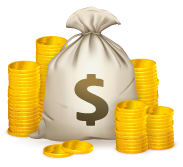 The Insurance bet pays the usual 2 to 1 winning payout, but that bet has a huge independent house edge attached to it so it is a bet you should never opt to place when playing any type of mobile Blackjack game as by taking Insurance you will increase the expected long term house.